When the survey was developed by our founder, AW Cohen, he originally expected that the best time to be long the market was when most advisors were bullish. This proved to be far from the case – a majority of advisors and commentators were almost always wrong at market turning points. Quite simply, professional advisors are just as susceptible to market emotions as individual investors – they become far too greedy at the top of trends and far too fearful near the bottom. Read what CNBC said about the biggest switch in sentiment for 7 years. Example, back in October 2002, there were many more bearish than bullish advisors – historically this has always been a good time to start thinking about buying the market. "................while it helps, we suppose, to be able to tell the difference between a balance sheet and an income statement and know what P/E stands for, nothing in the investment armamentarium beats an educated grasp of crowd psychology. Granted, getting a handle on investor sentiment is not an automatic guarantee of making a killing on the Street. It's a contrarian indicator that has been around for a spell, and like a lot of venerable technical tools is a bit the worse for the wear. It's grounded in the logical assumption that when everyone's bullish, it implies that a lot of buying power has already been used up and, of course, when everyone's bearish, the opposite holds. If not infallible (what is, as we've noted before, besides the pope and financial journalists? ), it provides investors with a highly reliable litmus test when the market reaches extremes of optimism or pessimism. And, right now, bullishness is dangerously rampant.For confirmation, just take a gander at that simple chart that enlivens this grim page, the handiwork of Investors Intelligence, which weekly tracks the view of those earnest souls, investment advisors, who tell you when, and often what, to buy and sell. It depicts the difference between the number of advisors who are upbeat and who are downbeat. That awesome spread in favor of the bulls works out to 41.6%, the most lopsided since the October 2007 all-time market peak, when the comparable gap was 42.4% and set the stage for the beginnings and forgive us for stirring painful memories of the worst equity disasters of the past half century." Subscribe today - Just click here! 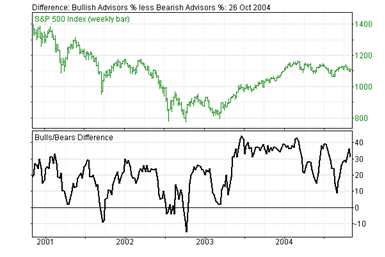 Advisors Sentiment subscribers can view the charts of this indicator going back ten years. Our analysts also highlight re-occurance of various historic levels as and when they occur. For hedge funds, "black-box" traders and quants we also offer the entire historical data set, from its start in 1963, for back-testing and modeling for proprietary systems. The data avaialble for a separate fee from the website subscription. It is available for purchase for US$1495. The data is emailed in Excel format upon payment by Visa/Mastercard/AMEX credit card, or receipt of a check or money order. Credit card payments greatly speeds the transaction, and be sure they are payable in US funds. Please note: The Advisors Sentiment Report is also available as part of our US Market Timing Service.